Last year Sahotra Sarkar published a paper that got me thinking. His piece entitled “The Genomic Challenge to Adaptationism” focused on the writings of Lynch & Koonin, arguing that molecular studies continue to present a major challenge to the received view of evolution, by suggesting that “non-adaptive processes dominate genome architecture evolution”. The idea that molecular studies are bringing about a gradual but profound shift in how we understand evolution is something I’ve considered for a long time. 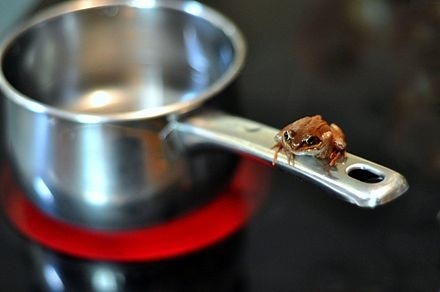 It reminds me of the urban myth about boiling a frog, to the effect that the frog will not notice the change if you bring it on slowly enough. Molecular results on evolution have been emerging slowly and steadily since the late 1950s. Initially these results were shunted into a separate stream of “molecular evolution” (with its own journals and conferences), but over time, they have been merged into the mainstream, leading to the impression that molecular results can’t possibly have any revolutionary implications (read more in a recent article here).